A major security conference will be held in Munich on Friday with top diplomats and statesmen participating. Ahead of the 55th Munich Security Conference, the hosts of the conference issued a 102-page report addressing several issues and crises around the globe. With the title "The Great Puzzle: Who will pick up the pieces?" the report's goal is to define the agenda of the conference and the featured topics are defined as: The future of transatlantic relations, the self-assertion of the EU and the danger of escalating great power rivalries. The 55th Munich Security Conference, which runs from Feb. 15 to 17, will host prominent and top diplomats from Europe, the U.S. and China. The report states that the global order is undergoing a significant change. As a result of increasing competition among big powers, in addition to the changing traditional role of the U.S. as global gendarmerie, the struggle over several regions may lead to the deterioration of the current situation. "If one believes the major strands of thinking in the capitals of the world's great powers, the world is entering a new era of great power competition," reads a part in the introduction. Underlining the fact that the U.S. considers Russia and China as the biggest threats, the report warns that a deterioration of relations among the U.S., Russia and China may lead to further tensions. Criticizing the U.S. administration under the presidency of Donald Trump, the report says the U.S.' relentless policies may accelerate the collapse of the current political order. Touching upon the desire of the U.S. to drag itself out of some regions, including the Middle East, the report indicates that the world may witness a change of U.S. hegemony. Referring to a survey conducted by the Pew Research Center, it said, "Only 14 percent of the global respondents believe that the United States is now doing more to help address major global problems compared to a few years ago. The view that the United States is doing less is particularly widespread among its closest allies in North America and Europe. 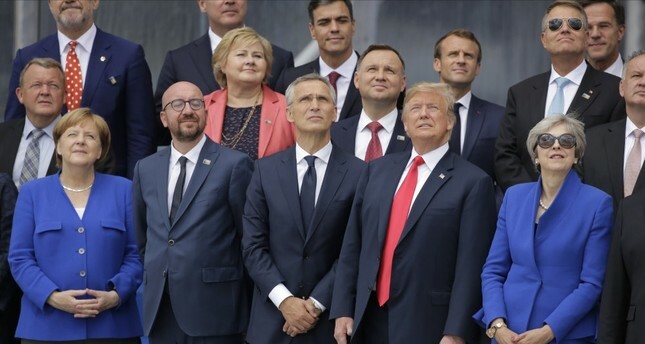 Their concerns have continued to grow since the tumultuous NATO summit in Brussels in July 2018, when Trump reportedly threatened to 'go it alone' if the rest of the alliance failed to dramatically increase their defense spending." In line with the claim that the U.S.' traditional role is changing, the report says the Middle East is undergoing a major transformation as "regional powers are ramping up their military capabilities." The report underlines the increasing armaments ratio in the region, saying, "Today, seven out of the top 10 countries that spend the highest GDP share on defense are located in the Middle East. What is more, between 2013 and 2017, the value of Middle Eastern countries' arms purchases doubled compared to the previous five thus bearing the risk of an arms race and military confrontation." On Syria, the report once again criticizes U.S. policy, saying Washington's policies are worrying for its allies. "Experts warn that the president's decision to hastily withdraw U.S. troops from Syria will likely have tremendous geopolitical consequences." Besides Syria, the report also mentions the ongoing crisis in Yemen, the Sahel region and the tensions in the Balkans. Mostly putting the blame on the U.S.' policies, the report concludes that the growing competition and rivalry among big powers may lead to catastrophic consequences.